From simple websites to websites containing several hundred pages to website applications that drive entire businesses and automate key business functions. Your website markets your business 24 hours a day. We deliver dependable service and results. How well does your website rank in the search engines? What keywords and key phrases rank well? These are crucial questions to your website's and business' success. Neomorphis has experience in local and global search engine optimization and can help you achieve search engine success. What is responsive website design? It's the ability of your website to be viewed on multiple devices, such as mobile devices, tablets and desktop computers. By 2015, it's predicted that the majority of web searches will be from mobile devices. To stay competitive, businesses must have a mobile presence. Neomorphis can design you a responsive website. Is social media really that important? Facebook, Twitter, LinkedIn, and Google+ have over 2 billion users! Social media builds relationships and establishes trust by directly engaging existing and potential customers. Let us show you how to grow your business through social media networking. We outline your goals and needs and collect information about your company and your competitors. We perform search engine research to see where you rank compared to your competitors. We also review your company's marketing material. Neomorphis can research and register your domain name, host your website and set up your e-mail accounts. 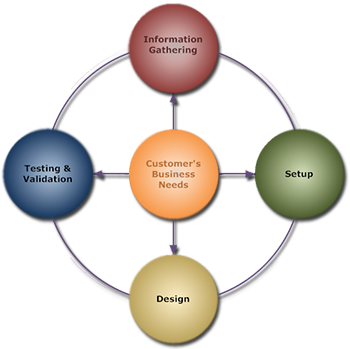 We also develop and install custom software. We take care of all the small, important details, so you don't have to. We work with you every step of the process and provide feedback to guarantee your project meets your expectations. Mock ups are provided and you can view the content of every page before it goes live. We thoroughly test your new website to make sure it works properly, has no broken links and adheres to industry web standards. This ensures it displays properly across multiple browsers and devices. Serving the Indianapolis area, including Arcadia, Avon, Beech Grove, Brownsburg, Carmel, Cicero, Danville, Fishers, Fortville, Franklin, Greenfield, Greenwood, Lawrence, Lebanon, McCordsville, Mooresville, Noblesville, Pendleton, Plainfield, Shelbyville, Sheridan, Speedway, Westfield, Whiteland, Whitestown and Zionsville, Indiana.